s we travel back through history we pass by the various 20th century productions until we arrive at the first stop on our journey; St. Petersburg, January 7th 1898, to be present at the Imperial Mariinsky Theatre for the very first performance of Raymonda, the latest ballet created by the great Petipa. Our progamme tells us that the scenario for this tale of medieval chivalry is by Lidiya Pashkova (née Vera Glinskaya), a Russian-French Countess who is the St. Petersburg correspondent for the French newspaper Le Figaro and the Russian Southern Region. In addition to being a columnist, Lidiya Alexandrovna writes ladies novels and plays based on scenes from contemporary life. Countess Lidiya is out to make a name for herself in the fashionable world of ballet and already has one success to her credit: the libretto for Cinderella (Zolushka) written in partnership with Ivan Vsevolozhsky, Director of the Imperial Theatres, and first presented by the Imperial Ballet in 1893 choreographed by Enrico Cecchetti with the production supervised by Marius Petipa, Premier Maitre de Ballet of the St. Petersburg Imperial Theatres. 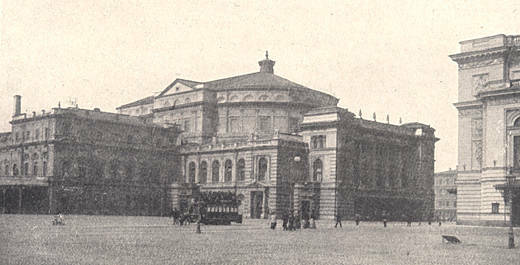 Though not in the itinerary of our search for Raymonda, while traveling backwards in time to the Middle Ages let’s stay in St. Petersburg until 1893 to be at the Mariinsky to see Pierina Legnani make her debut with the Imperial Ballet in the premiere of Cinderella and witness the historic occasion when for the first time ever in public performance a ballerina accomplished 32 fouettés en tournant. 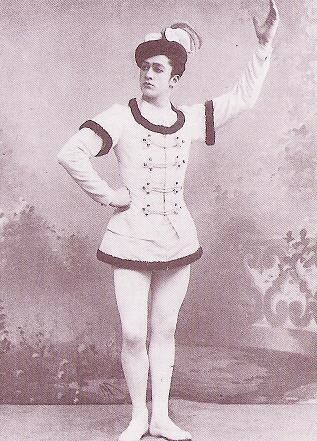 Dancing the title role, Legnani did them without stopping and without traveling an inch, having to encore her success, although doing only 28 fouettés. So, the audience was counting even in those days! 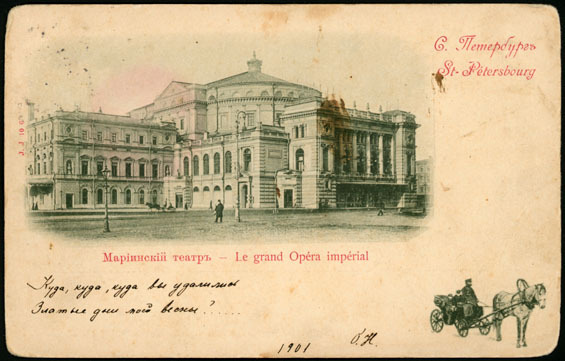 Better still, now that we’ve arrived in 1898 and are staying on till 1893, we can attend the Mariinsky for the 1895 premiere of the Petipa/Ivanov Swan Lake with Legnani as Odette/Odile. And in 1894, if you’re up for it, you can come with me and gatecrash the first performance of Le Réveil de Flore presented by the Imperial Ballet for the court at Peterhof in honour of the wedding of Grand Duchess Xenia Alexandrovna to Grand Duke Alexander Mikhailovich. Two premieres not to be missed at any cost! 1895 is also an important year for us to be in the Imperial capital because we can get to know more about Countess Lidiya. That year a topic of conversation in St. Petersburg drawing rooms was France’s wars of conquest in Africa, a subject of interest to Pashkova as she was a great traveler, a member of the French Geographical Society and a respected travel writer. Even Tolstoy himself read her essays and drew information from her book “The French and British Colonies in the Far East” published in Odessa 1886. Lidiya Alexandrovna spent many years in Palestine, Egypt and Syria, sometimes in the company of the esotericist Helena Blavatskaya, who became famous as Madame Blavatsky and was a founding member of the Theosophical Society. Pashkova also traveled to Aden where she met Natalia Blavatskaya. It was Pashkova’s journeys in the Middle East and North Africa that led to her interest in the history of the Crusades to regain possession of the Holy Land, allowing her fanciful imagination to take her into the fairytale world of “Once upon a time” with crusader knights in shining armour rescuing beautiful damsels in distress. Envisaging her romantic story as a ballet, she prepared a libretto which she submitted to Ivan Vsevolozhsky in 1895. Not impressed, the Director of the Imperial Theatres at first rejected the scenario. However, Countess Lidiya Alexandrovna had powerful patrons at court and could not be dismissed so easily. Vsevolozhsky took some time pondering on how to proceed with the story and eventually rewrote the libretto, which was then worked on by Petipa, although in the programme the scenario is quite rightly credited to Ms. L. Pashkova. When Nureyev was staging Raymonda for the Paris Opera Ballet he tried to find a copy of Pashkova’s original story but was unsuccessful, as I was in my own attempts to locate a copy when researching this article. 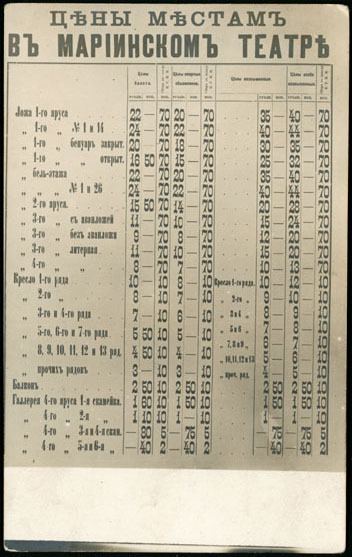 Therefore, let us take as our primary source the programme of the Pashkova/Vsevolozhsky/Petipa version, which is preserved in the Mariinsky archive. So, here we are at last, taking our seats in the stalls of the Mariinsky Imperial Theatre, the beautiful auditorium ablaze with diamonds adorning the hundreds of bejeweled society ladies. We’ve paid our 30 kopecks for the programme and while we await the first big performance of the evening, the entrance of the Imperial Family, let’s find out what we can expect on this glittering first night. We already know that the premiere is a benefit performance for prima ballerina assoluta Pierina Legnani in the title role and that she will be partnered by Sergey Legat, but being seasoned ballet goers we want to know who else is dancing tonight. Wow! What line up of Mariinsky legends; Kschessinska, Preobrajenskaya, Trefilova, Egorova – and Pavlova, even though she is still in her final year at the Imperial Ballet School and not due to make her official debut with the company until after her graduation next year. And as an extra treat for us time-travelling balletomanes we even have the eighteen year old Agrippina Vaganova, on her way to becoming the queen of variations. What’s more, we’re actually going to see the bitchy Bakerkina, who we know of only because Kschessinska tells how she tried to make trouble with the young Karsavina over the trifling matter of a gift of a costume in deep lilac colour. Next, looking at the list of characters we see that, unlike modern productions, we have two Countesses; it is Raymonda who is the Countess de Doris, while her Aunt Sibyl is both a Countess and a Canoness. No time to read the plot because now we must stand and turn to face the Imperial box for the awesome spectacle of the entrance of the Tsar and the Dowager Empress Maria Feodorovna, followed in correct order of precedence by Empress Alexandra Fedorovna and our favourite patrons of the ballet, the Grand Duke Vladimir Alexandrovich and his magnificent Grand Duchess, Maria Pavlovna, outshining even the two empresses with her fabulous jewels. And how interesting to note that tonight Nicholas II is not taking his usual seat in the Tsar’s box to the left of the stage; but of course – Kschessinska is only dancing a minor role tonight! Now the lights start to dim and in comes the conductor – Riccardo Drigo no less – and St. Petersburg gets to hear the first notes of Glazunov’s score. Curtain up on Act I Scene 1, titled La Fete de Raymonda. The set is magnificent – the Hall of the Castle of the Countess de Doris. The troubadours Bernard de Ventadour and Beranger d’Aquitaine are playing the lute and viol. The music lures maidens away from their tasks and they dance with the pages. Enter Countess Sibyl, who admonishes the girls for neglecting their duties, but she fails to restore order and others join in the dancing, so she commands Bernard and Beranger to stop playing. Turning to the maidens, she points to the statue of The White Lady, telling them that this is a former Countess de Doris, a beloved ancestor whose ghost appears from another world to warn and protect anyone in the House of Doris and punishes those who do not do their duty. The young girls laugh at this superstition and try to pull Countess Sybil into the dance. A horn sounds the arrival of a messenger with a letter from Jean de Brienne to his fiancée the Countess Raymonda. The Countess Sibyl goes off to tell her niece the good news, while the seneschal oversees preparations for the arrival of Raymonda and the maidens strew flowers along the path their mistress will take. Enter Ms. Legnani to rapturous applause. The messenger kneels and hands her the letter with the news that her betrothed, Jean de Brienne, having fought valiantly under the banner of King Andrew II of Hungary, has returned from the Crusade and will arrive at the Castle de Doris no later than tomorrow. So, in the original production, our hero didn’t make it back in time for his girl’s fete day! Who does turn up instead is the villain of the piece, Abderrahman, accompanied by his entourage of Saracen and Spanish dancers, soldiers and slaves bearing gifts. Countesses Raymonda and Sibyl are surprised at this uninvited guest but the tradition of the House of Doris is that all visitors must be admitted. Hmmh! Forget the tradition and gifts, I wouldn’t let this guy and his army in to my castle, would you? After being greeted with great dignity, Abderrahman tells how he has heard of the beauty of Raymonda and the legendary hospitality of the Castle de Doris, and has come to congratulate the lovely young Countess and present her with gifts. When Raymonda rejects his gifts, Abderrahman, in an aside, confides to his one of his henchmen that he intends to abduct Raymonda. Didn’t I say not to trust this guy? On with the dancing, a grand valse, then Raymonda instructs the seneschal to arrange a Cour d’Amour for the morrow in honour of the arrival of her fiancé. All exit except Raymonda, Clemence, Henriette and the two troubadours. The sky darkens and the stage is bathed in moonlight. Raymonda plays the lute then, passing it to one of her friends, shows them a new dance. Exhausted by the events of the day, she rests. Suddenly, a magical lethargy descends on the scene and everyone falls into a sleep except Raymonda, who is drawn by a mysterious force to follow The White Lady. Act 1 Scene 2. A park on a high terrace of the Castle de Doris. This is some big castle! Now we get the vision scene. The park is shrouded in mist. The White Lady enters followed by Raymonda in a state of trance. The mist lifts to reveal Jean de Brienne surrounded by his knights – note, no portrait coming to life – and, intoxicated with happiness Raymonda throws herself into his arms. More dancing then The White Lady dispels the vision of Jean de Brienne and tells Raymonda to wait and see what is to happen next. The stage darkens and the foreboding apparition of Abderrahman appears. He declares his love for Raymonda, which she indignantly rejects. Abderrahman attempts to abduct Raymonda who begs The White Lady to save her. She falls unconscious. The first rays of dawn appear and The White Lady, Abderrahman and the other apparitions disappear. Ladies, servants and pages rush on to the terrace and attempt to revive Raymonda. Interval – time for champagne and caviar, of course – and much excited discussion about events so far. The St. Petersburg cognoscenti agree; Legnani is in top form and dancing divinely – her pizzicato variation stopped the show. Act II. The Cour d’Amour: another magnificent set, this time a Courtyard in the Castle de Doris. Raymonda welcomes her guests but cannot hide her dismay that her fiancé is a no show. Enter Abderrahman and his entourage. Countess Raymonda asks for him to be dismissed but Countess Sibyl reminds her that according to tradition all visitors to the Castle de Doris must be welcomed with honour. Grand pas d’action. Abderrahman again attempts to plight his troth but Raymonda rejects him with disdain. He commands his minions to entertain Raymonda with Arab and Spanish dancing. Butlers fill the guests’ cups with wine and we have a Bacchanalia – yes, that’s what is says in the programme, a Bacchanalia – at the height of which Abderrahman attempts to carry off Raymonda. Cue for the valiant Jean de Brienne to appear accompanied by King Andrew II of Hungary. Our hero rescues his damsel in distress and goes for Abderraman, but King Andrew orders the fighting to stop. The King orders Raymonda away from danger just in time before the Saracens start fighting again. The White Lady appears at the back of the stage. Jean de Brienne inflicts a mortal sword wound on Abderrahman who is carried away by his slaves. The rest of the entourage attempt to escape but are taken prisoner on the orders of King Andrew. The King joins the hands of the young lovers. Interval – more champagne, this time with a delicious coupe glacée – and back to our seats for ACT III: A Garden in the Castle of Jean de Brienne. Festivities for the wedding of Raymonda and Jean de Brienne, celebrated with a splendid Hungarian divertissement in honour of King Andrew, then a gallop and the ballet ends with an apotheosis depicting a tournament – yes, a tournament complete with knights jousting and all. Well, it isn’t quite like the productions we’ve got used to seeing, but Raymonda has a long future ahead of it and we know that later choreographers will try to make more sense of the scenario. While Nureyev’s Paris version stays closest to the original Mariinsky, most others have tried to make the story more acceptable – in my opinion, Grigorovitch’s revised version for the Bolshoi is the most successful. But I still have a problem with that Bacchanalia. What a way to carry on at the Countess Raymonda’s elegant Cour d’Amour. You can’t take those Saracens anywhere! 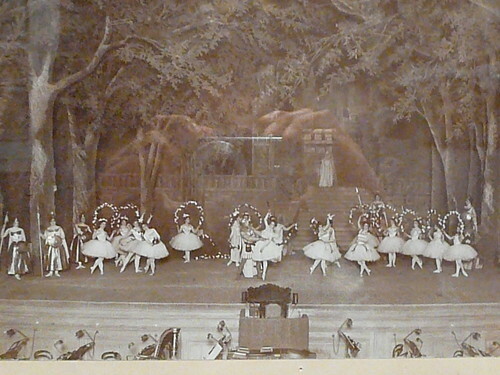 And some of these 19th century ballerinas could lose a kilo or two! Nonetheless, tonight who’s complaining. We’ve been privileged to be present at the premiere of a great new ballet with a happy ending and loads of flowers. We’ve shouted our bravos and then lingered at the stage door to applaud Pierina Legnani yet again as she goes on to celebrate her latest triumph – at Cubat’s no doubt – and now we set off for home marveling that the octogenarian Petipa has given us yet another masterpiece. However, our euphoria soon evaporates in the cold night air of St. Petersburg, leaving us all too aware that something about the ballet was not quite right. We loved the brilliant choreography, the divine dancing, the magnificent sets, the beautiful costumes and the glorious Glazunov, but it’s obvious that the weak link is the story line. Contrived is putting it mildly. The White Lady is no problem: we’re used to supernatural beings – where would the repertoire be without them. Ever since La Sylphide and Giselle, audiences – and prima ballerinas – have demanded a white act, a vision scene or a dream scene. But what on earth are a Saracen and his entourage doing in the South of France, enemy territory at the time of the crusades, and why are the gates of the Castle de Doris so readily opened to admit the sinister Saracen and his entourage? Well, of course, dear old Petipa usually gives us an act with exotic dancing. He has already taken us on trips to sunny Spain with Paquita and Don Quixote; ancient Egypt with La Fille du Pharaon and mysterious India with La Bayadere. What to do next? This time he decided to give us a taste of Moorish Andalusia. So now we know how Abdurrahman and his entourage got into the story! And, naturally, the ballet must have a spectacular last act with the usual national dances. What to do this time? Why not something Hungarian? St. Petersburg society loves a good czardas and that gives us a reason to bring in King Andrew II of Hungary because he was a real life Crusader. Now we’re getting somewhere, an actual historical personage. Are there others in the story? Was there a real Jean de Brienne and did Raymonda herself ever exist? To find out the answers to these questions I decided to dig in the rubble of history. I do not claim to be a writer but taking up my pen in its modern incarnation – the keyboard – in a series of articles I will tell you what my digging has turned up as we continue our on our journey to discover the life and times of the real Raymonda.